Download an MP3 file of the first movement of this work (SATB version) performed by Toledo Choral Society, Richard Napierala, conductor. Download an MP3 file of the first movement of this work (SATB version) performed by Northsong Chorus, Anne Hamilton, conductor, Amos Hamilton, clarinet, and Vivian Spates, piano. Download an MP3 file of the second movement of this work. Download an MP3 file of the third movement of this work. 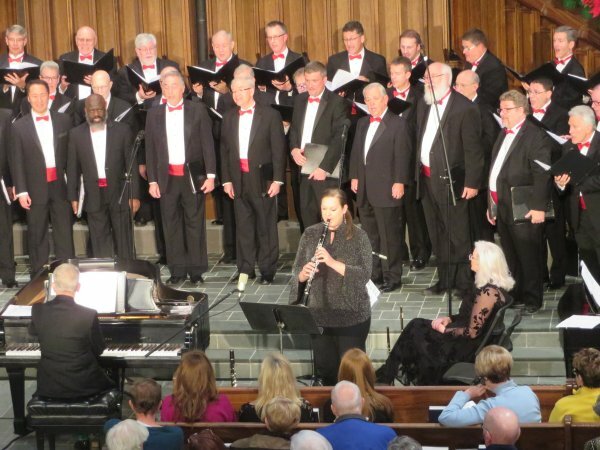 Download an MP3 file of this work (TTBB version) by the River City Men's Chorus, David A. Glaze, conductor, Natalie Szabo, clarinet. Download a PDF file of the full score (SATB version) of this composition. This file is for perusal only and is not printable. Download a PDF file of the full score (TTBB version) of this composition. The Friendly Beasts (and other Christmas Carols) is a set of adaptations of familiar Christmas carols. The songs were chosen for their character and personality, which might translate well into colorful arrangements. "Born in Bethlehem" is a numbers song, similar to "The Twelve Days of Christmas." Each group traveling to the Nativity, or associated with Jesus, is presented in ascending numerical order, from one to twelve. ["One for the little bitty Baby... Twelve for the Twelve Apostles"] Once the complete set has been introduced, the numbers are performed in reverse order, in a frantic race (prestissimo) from twelve to one. This is an energetic song! "The Friendly Beasts" portrays the animals who have protected Jesus and Mary during the birth. Each animal proudly takes its turn announcing its contribution. The donkey carried Mary "up hill and down." The dove "cooed" the Child to sleep. At the end of the song, all of the animals reappear in quick succession: donkey, cow, sheep, dove. They recount the gifts they brought to Immanuel. The third song, "Angels Singing," is based on the carol "Angels We Have Heard on High." This new arrangement opens with shepherds (Tenor and Baritone soli) hearing angel voices, "o'er the mountains, guided by a Holy light." A few angels (women's voices) sing in the distance. The carol now shifts to full chorus. Often, the men portray the shepherds, and the women sing as angels. 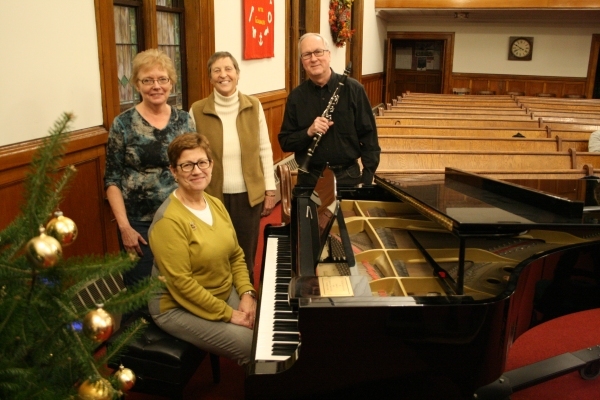 The clarinet plays a featured role in these songs, enhancing the message of the lyrics. For example, in the first song, the phrase "Children, go where I send thee" is matched by the Clarinet scampering up a scale as children setting forth on a trip. And the next line, "How shall I send thee?" has the Clarinet/children coming back down the scale, returning home. In "The Friendly Beasts," the clarinet associates with each animal, braying as a donkey, warmly mooing as a cow, embellishing as a sheep with "curly horns," and fluttering upward with trills as a dove in flight. Throughout the set, the versatile nature of the clarinet is called upon to present a wide range of roles: rhythmic, melodic, animal, angelic, blending with the chorus, emerging as a soloist. Perhaps by the end, the listener might conclude that the clarinet has portrayed every character in the songs!